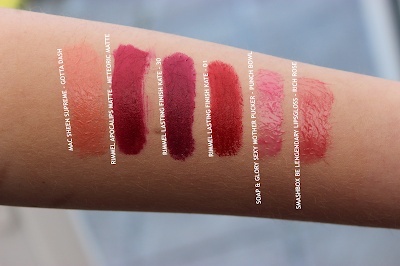 I don't think lips get enough loving on the blog so today is the day that they do! Rimmel 'Lasting Finish by Kate' are my favourite drugstore lipstick formulations. They're very long-lasting, easy to apply and don't dry out your lips which makes pretty darn good! Yes, this is technically the same product but this shade of red is just perfect! It's neutral which means it suits every skin tone and it goes by all the points above. Most importantly it's an exact dupe for MAC's Ruby Woo which is on everybody's wish list! I have no idea where it's from or when I got it but this little lipstick holder comes in so handy when I just want to chuck a lipstick in my bag. It means that you can find it easily instead of rummaging around like a loon and it stops the cap from falling and spreading all its goo about the place! I'm not usually a fan of these felt-tip style lip stains as they seem to dry out ever-so quickly but this one has lasted for so long! I love the shade too, it's a subtle 'my-lips-but-better'. Apologies for not including a swatch below, I just completely forgot! Lush, Lush oh how I love Lush and this lip scrub is no exception to the rule! It does a cracking job at scrubbing all the dead skin (that grossed me out just typing it, sorry!) off my lips and leaving then smooth which is especially good if I'm wearing a bold lip. Also, it's completely edible and it tastes just like mint ice cream (pray emoji)! The root of perfect lips is moisture and therefore getting the right treatment is key. I love this lip butter from Nivea, there's nothing very special about it just gets the job done and well! They have some really nice flavours/scents (whatever you want to call it) too which is always a bonus. Tip: It's important that you don't have petroleum jelly in your lip balm, which this one doesn't, for science-y reasons. This might be my favourite product on this list - it is just a-maze-ing! I actually just picked this up on a whim in Boots a while ago and I'm glad I did. It's long-lasting, matte but not drying, so smooth and easy to apply. I think it's safe to say that MAC are just killing it with there lipsticks, granted, but I particularly love the sheen supreme formulation. It just glides onto the lips leaving a gorgeous subtle tint but can be layered for a more intense look. Plus, it smells or chocolate so it really does tick all the boxes! Mac Sheen Supreme in Gotta Dash! This is bit random but I do love this Soap & Glory lip plumper. It's not something I use very often but when I do it does a great job and leaves a pink tint which I think would suit most skin tones but there are lots of shades to choose from. I'd like to give them title creds too! Look at this cute little man! I know it's only a sample size but this is my favourite lip gloss formulation of all time; it's not extremely pigmented but I don't really expect that for this kind of thing, it's so long lasting but not sticky which is something of a miracle!